The license key will be email to you immediately once the payment is settled. It is sent from Evinco Account Dept (account@evinco-software.com) and title is "License Information of PhotoPDF Photo to PDF Converter Software Professional Version". One-time payment. No monthly/yearly fees. Permanent License. You can use the software as long as you want. One license is required for one computer. License includes 1-year free version updates. There is no obligation to purchase update after the free update period. Evinco is Paypal Verified. You can make payment with your PayPal account. 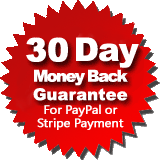 PayPal also accepts Visa, MasterCard, American Express, Discover, and Debit Card payments. We choose Share-It! as ecommerce provider. It is a well established software registration/credit card processing agent and already handled several million transactions. Share-It! accepts Visa/Master, American Express, Bank Wire-Transfer, Check payments.